This album is an example of how good an acoustic album really can be - beautiful songs, a varied sound with different influences or styles blended together, personal and emotional lyrics - a fantastic album. 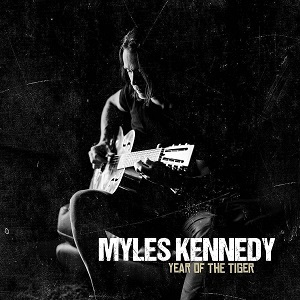 Alter Bridge singer Myles Kennedy has a new solo album – Year of the Tiger. If you’re hoping for something similar to Alter Bridge then you may be disappointed – this is very different – it’s a solo acoustic album. Check out the video for the title track, Year of the Tiger..
Solo acoustic albums are often done – in theory it’s a simple style but in reality it’s incredibly hard to get it right. All too often, singers release a solo acoustic album that is frankly dull and boring and sounds fairly generic, so to make it interesting enough to stand out from the crowd is not an easy thing to do. Thankfully Myles Kennedy is talented enough to avoid the pitfalls and manages to make a very enjoyable album. For a start he doesnt just play acoustic guitar – he also plays the lap steel, banjo and mandolin, all instruments that have quite distinctive sounds, so that use of a range of instruments means there’s a much wider variety in the music. He’s also got a drummer working with him on some songs that adds to things. More important than the choice of instruments though is the songwriting which is absolutely fantastic. It ranges from Rock to Blues to Country and Americana, and the way he blends those styles really is well done. As always, his vocals are fantastic – he handles the softer gentle parts and the heavier rock parts with equal ease. The lyrics are personal and emotional and his vocals convey that emotion to the listener perfectly but without it feeling too dark or depressing. This album is an example of how good an acoustic album really can be – beautiful songs, a varied sound with different influences or styles blended together, personal and emotional lyrics – a fantastic album.